It’s been called the “Madonna” of nightclubs. Like the Material Girl herself, Chicago’s renowned Enclave has shown a remarkable ability to change with the times, keeping itself at the top of the Windy City’s nightlife scene for seven years. During that time, some of the biggest music artists have rocked the 15,000 sq. ft. club’s stage, including the Black Eyed Peas, Lil Jon, Lady Gaga, Kid Rock and Akon. Its VIP guest list also reads like a Who’s Who from the entertainment and sports worlds – Paris Hilton, Tom Hanks, Kim Kardashian, Michael Jordan, Tony Romo and Anna Kournikova, to name a few. 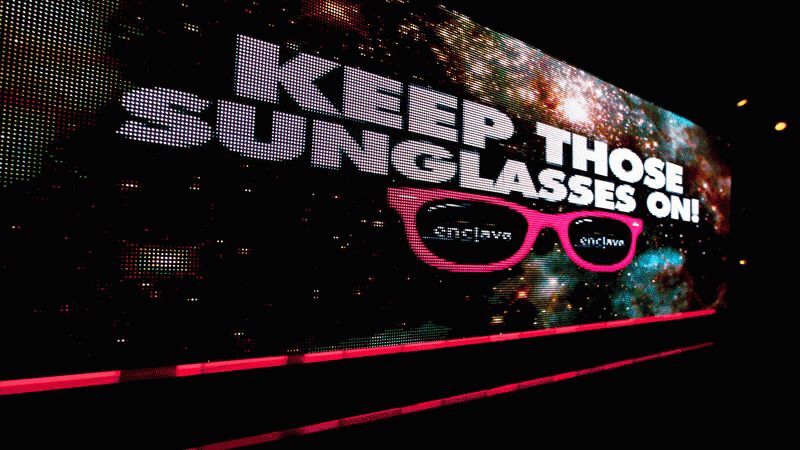 In its latest incarnation, Enclave has emerged as a hot electronic dance music venue, featuring nationally famous DJ performers. Along with a new state-of-the-art sound system, the club has added an LED video wall, made up of fourteen EPV 762 LED panels from Elation Professional. Configured in front of the DJ booth, the 12’ x 3.5’ video wall has been an important centerpiece in the club’s transformation. “Enclave was looking to become a more DJ-oriented club. And many of today’s top DJs just won’t perform in a venue that doesn’t have a video wall,” noted Randy Zahora of Buzzfire Inc., the Chicago-based nationwide dealer that supplied the Elation screen to Enclave. Enclave looked at a number of LED screens from various manufacturers and dealers before choosing the Elation EPV 762. Along with the quality of the product itself, one of the big factors in their decision was the high level of service provided by both Elation and Buzzfire, according to Jennifer Pohl. “Our philosophy is, ‘If you’re going to do something, do it right,’” she said.